"For us, we get to see our patients participate in a big event, normal activities away from the hospital, and it gives us a sense of accomplishment," (Dr. Stephen J.) Forman said. 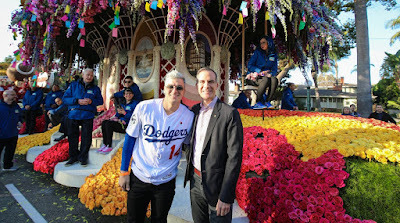 "Having Kiké on the float is extra special because City of Hope is Dodgertown. 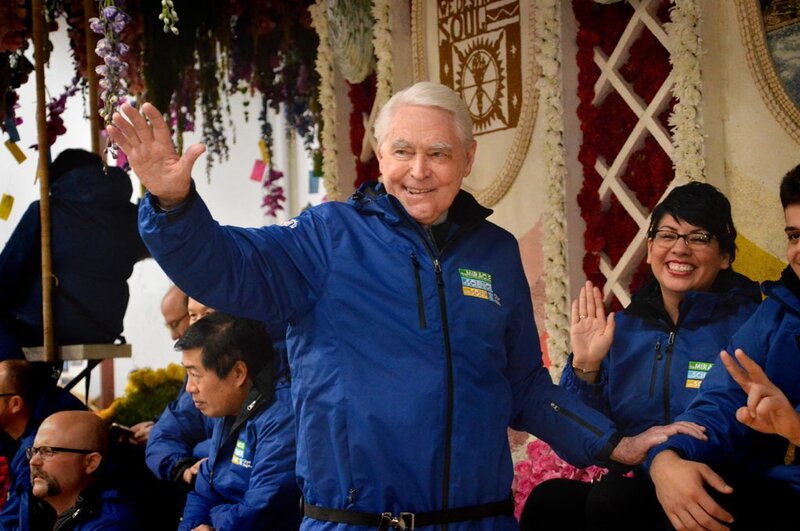 There are a lot of fans among the patients and staff, and it gives us a lot of pride that he honored us by being on the float with his dad. To see father and son on the float together is what it's all about. We wanted them to have this special occasion." This Day in Dodger History: In 1911 Dodgers president Charles Ebbets announces that he has completed the purchase of 4.5 acres of land in the Pigtown section of Brooklyn to build a new concrete and steel stadium. In 1935 the Dodgers selected Cubs catcher Babe Phelps off of waivers. He would go on to play seven seasons in Brooklyn -- slashing .315/.368/.477/.845 and attended three All-Star games. In 2004 the Dodgers signed free agent infielder and pinch-hit savant Olmedo Sáenz. All hail the "Killer Tomato". Happy Birthday, George Boehler, Bobby Reis, Cliff Dapper, Bill Madlock, Greg Heydeman, Mike Metcalfe & Scott Proctor! Podcast: Jim’s View at the Press Enterprise: A conversation with Trevor Oaks (Podcast Link). Rowan Kaver at Dodger Insider shares even more pre-wedding pics from Hyun-Jin Ryu & Ji-Hyun Bae wedding. They officially tie the know this coming weekend. Rowan also makes note that Justin Turner, Alex Wood and Ross Stripling also got married this off-season, and Kiké Hernandez, Austin Barnes and Joc Pederson got engaged. LOL! Via Daniel Starkand at Dodger Blue; "Dave Roberts Booed While Attending Chargers-Raiders Game." David Hood at True Blue LA shares his, "2018 top Dodgers prospects: No. 21-25." Sue Joe at Dodger Insider shares; "Top 10: Best social media posts from Dodger players in 2017." Via Timothy Rapp at the Bleacher Report; "Astros World Series Win over Dodgers Cost Las Vegas Sportsbooks Record $11.4M." This is an important observation. Per J.P. Hoornstra at Inside the Dodgers; "Headed for Japan, O’Koyea Dickson reflects on his Dodgers tenure." Via Berry Tramel at NewsOK; "Rose Bowl travelblog: Lunch with LA icon Ross Porter." On June 4, 1968, Porter had bought tickets for the musical, “Cabaret,” to celebrate his wedding anniversary. Also on June 4, 1968, Don Drysdale was pitching for the Dodgers against Pittsburgh, seeking his sixth straight shutout en route to what would become a 58-2/3 consecutive scoreless innings pitched. And June 4, 1968, was the date of the California presidential primary.